A bivy is a lightweight personal shelter you can carry around while backpacking. Consider the free Bivy app a lightweight outdoor adventure guidebook. 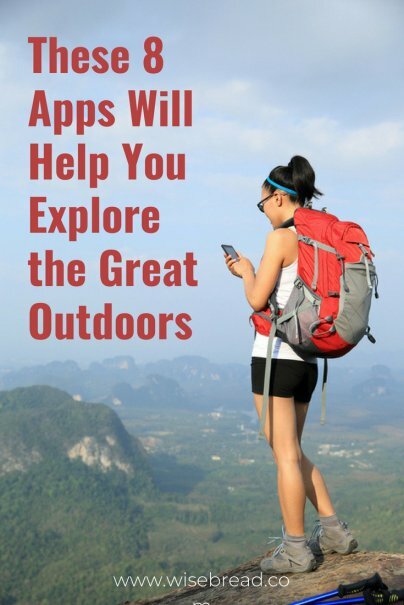 You can pull up the app when you're in a new area looking for a good hike, climb, or paddle. Better yet, you can use the app to record and share your adventures with fellow nature lovers. There are several apps out there purporting to tell you what bush or tree you're looking at through photo recognition, but PlantSnap gets the best reviews from the most users on the iTunes App Store and the Google Play Store. I'm famous for missing wild animal sightings — or tripping over my own feet — because my nose is buried in a guidebook. Just Ahead allows you to keep your head up and listen to an audio guide to a number of National Parks, including Yosemite, Zion, the Grand Canyon, and more. If the price seems high for an app (the app is free but each travel guide is an in-app purchase up to $19.99), keep in mind that these tours are professionally written and narrated by experts who have written for National Geographic and other publications. Both of these apps use your phone's GPS and the concept of augmented reality to show you the stars and other celestial bodies that hover in the direction your phone is pointed. The reason I'm listing both is that Sky Guide (for $2.99), made by Fifth Star Labs, is not available for Android. Instead, Android users (and iOS users) can try Star Walk 2, by Vito Technology, which is available in both free and $2.99 versions. As with the sky mapping apps, the best app in this category, ChirpOMatic, is only available for the iPhone at $3.99. So Android users looking for the same features use Bird Song ID, for $4.99. Sometimes referred to as "Shazam for birds," these apps let you record bird calls, then they analyze the sound and guess what bird you're hearing. Like plant recognition apps, these are used with varying success; some reviewers love them and others end up frustrated. AllTrails is a popular map app that covers the basics you would expect, like helping you find a promising trail and giving you directions along the way. One thing users love is seeing other users' comments; a recent review can save you from trying to hike a path that's covered in snow or searching for a waterfall that dried up a few years ago. With more than 50,000 ratings on iTunes, your chances are good that another user has recently tread the path you wish to explore.